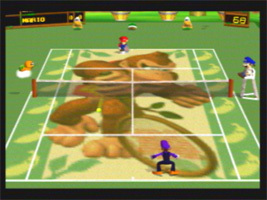 A tennis game for N64 starring Mario and friends on courts all over the Mushroom Kingdom. The aim is to win games, sets and matches by hitting the ball over the net, off the court and past your opponent to score points. The first player to score 40 wins the game, and the player that wins the most games wins sets and matches. You can also play doubles, with two characters a side. Winning tournaments unlocks more characters and courts. You can play on these courts in exhibition matches or in multiplayer mode. Tennis minigames are available, and you can even transfer your custom character from Mario Tennis on Game Boy Color.